Sprouted or germinated food has been around for centuries. In the past, most grains were eaten in the partially germinated form. Modern farming techniques prevent grains from germinating before they hit the table. The process of germinating seeds produces vitamin C and increases vitamin B and carotene content. In addition, sprouting neutralizes phytic acid, a substance that is in the bran of all grains which inhibits absorption of calcium, magnesium, iron, copper and zinc. Pea Sprouts are germinating green peas which contain a good amount of calcium, carotene, vitamin B and C. Sally Fallon warns against the over consumption of raw sprouts in her book Nourishing Traditions. 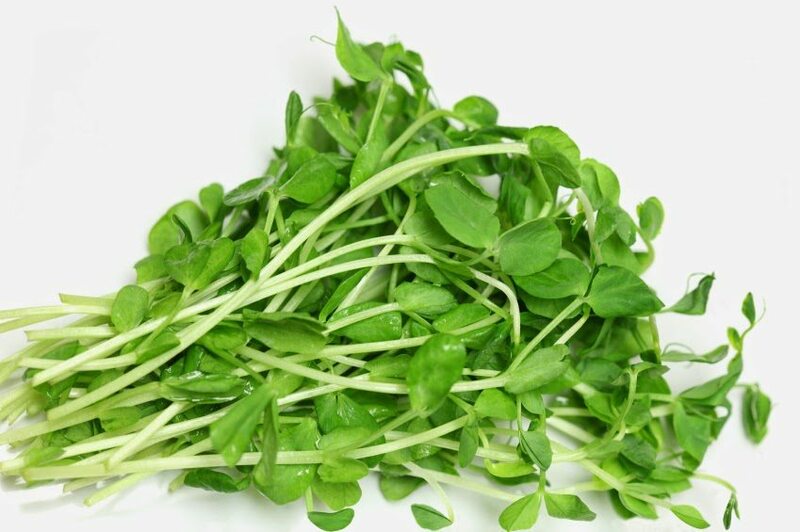 However, in this recipe the pea sprouts are lightly steamed which neutralizes their irritating substances. Mushrooms contain a substantial amount of B vitamins, selenium, copper and other trace minerals. Additionally, researchers have discovered they contain antibacterial and other medicinal substances, including anti-tumor compounds. Melt butter or ghee in a large skillet over medium-low heat. Add leek; cover and cook until leek is soft but not brown, stirring often, about 7 minutes. Increase heat to medium-high. Add garlic and mushrooms and sauté until mushrooms begin to brown, about 7 minutes. Add pea sprouts and cook until sprouts just begin to wilt (tossing often) for about 3 minutes. Season with sea salt and freshly ground pepper. Love this! Looks fun and I love mushrooms! Hi Rosetta, Thanks for asking! Ghee is clarified butter that has a high smoking point and can be stored without refrigeration for weeks. It is great for people who stay away from most dairy products, although it is important to note that well-prepared ghee is not dairy-free, but it is casein-free (casein is a protein found in dairy that has been known to cause allergies). You can buy it at the store or make it at home. It has a rich and slightly nutty flavor that is truly delicious.